During the second world war, Germany had absorbed the Yugoslavian government's inventory of Mauser rifles into its military and had stripped the Military Technical Institute, Kragujevac (fore-runner to the Zastava factory complex) of most useable machines for use elsewhere in the Reich's armaments industry. 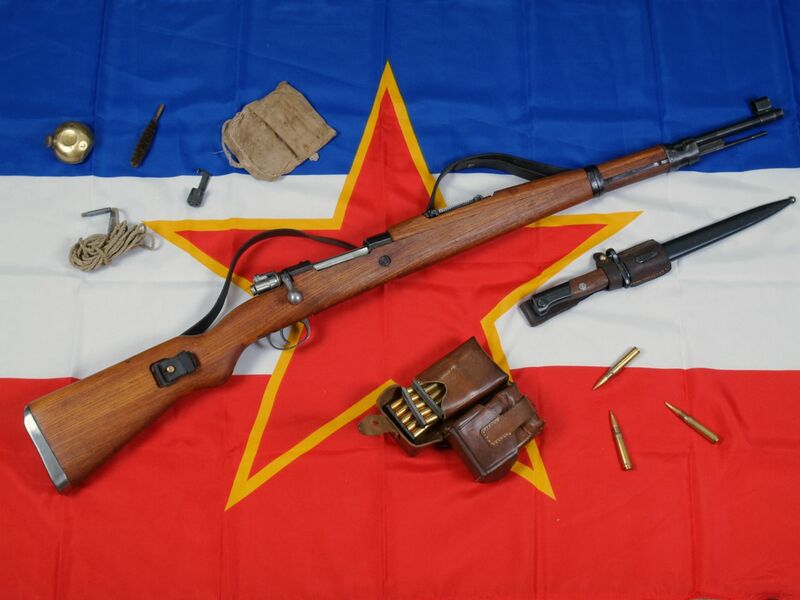 After the war's conclusion, Yugoslavia had effectively no remaining capacity to build complete rifles and the technology to do so would have to be re-developped and relearned by its craftsmen. Re-armament began by refurbishing the German K98k rifles on-hand at the time of the German surrender. These rifles provided the Yugoslavian armed forces with the backbone of their equipment until a longer-term solution could be found. Beginning in 1947, many of the old rifles and barelled actions on-hand were upgraded and rebuilt into serviceable arms to further bolster the military and satisfy their need for equipment. The guns were converted using new and old parts and were stocked in new and used wood identical to pre-war Model 1924 rifle stocks. In the cases where older stocks with VZ24 type side-swivels were used, the side-mounted hardware was removed and the holes plugged with dowels. These became known as the Model 24/47. Despite the continued availability of refurbished German K98k and M24/47 rifles, the further need for arms continued. Many of the necessary machines to manufacture rifles were acquired abroad, most notably from stocks of captured German machines in the Soviet Union. Based on prototyping begun in 1948, in 1950 the Model 48 Mauser was finalized and adopted for service. The M48 borrowed on pre-war M1924 and wartime K98k features and combined both in the finished product. It was made entirely out of milled steel parts with wood stocks (walnut, beech and elm were used throughout production). The bolt handle was turned down like on a K98k, but there was no dish cut in the side of the stock. Instead, the bolt handle bend was less severe and the bottom of the bolt handle knob was flattened to give the fingers room and purchase on the handle during operation. The receiver was shortened by 6.35mm to minimize bolt travel and the bolt stop was redesigned such that the ejector spring was integral to the bolt release spring. The K98k type of band and spring arrangement was used and no provision was made for a bolt-takedown mechanism in the stock. The M48A which replaced the M48 was essentially the same basic rifle, but with production time saving changes involving the use of stamped sheet steel parts. The M48A's chief difference from the M48 was the use of a stamped metal floorplate. Production of the M48A ran from 1953 through 1956 when it was replaced by the M48B. M48A and M48B rifles both have the same receiver crest and are both marked M48A on the receiver. M48B's differ only in the use of additional stamped parts, the most obvious part being the trigger guard. 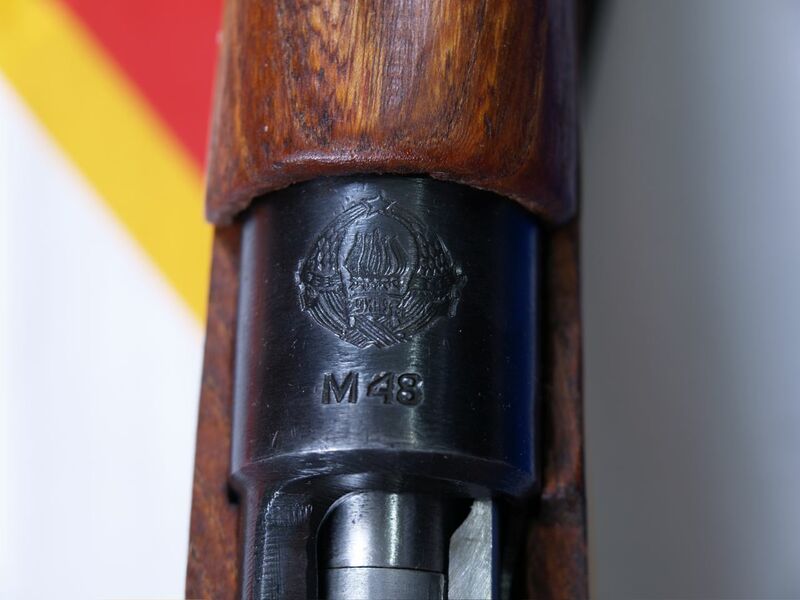 The receiver side wall of the M48 series rifles will be stamped Preduzece 44 which is the marking used for the Preduzece Crvena Zastava (Red Flag Factory) and the cyrillic FNRJ which is an acronym for the Federal National Republic of Yugoslavia. Most parts will be stamped with a "BK" surrounded by a circle. This is an acceptance/inspection stamp meaning "Military Control" to ensure quality of manufacture. The issue bayonet was also marked Preduzece 44 and was carried in a blued steel scabbard with a leather frog. Although the first batch of M48's was stocked in walnut (only a few thousand rifles), the expense of the wood blanks forced a change to more affordable species. The majority of M48 series rifles will be stocked in either beech or elm. All models of M48 can sometimes be found completely lacking all markings aside from the serial numbers. These models are collectively referred to as M48BO. BO = "Bez Oznake" Which translates roughly to "without markings". These guns would have been sold or given as foreign aid to countries and organizations with which Yugoslavia did not want to be publicly associated. 1. Most Yugoslavian rifles the collector is likely to encounter in Canada were brought into that market by Marstar Canada in the late 1990’s, though the bulk of Marstar’s Yugoslavian rifle inventory was subsequently retailed in the United States through large Military Surplus retail stores and importers. Later exports from the former Yugoslavia have been, for the most part, exported directly to the United States by a variety of companies. Though some of these rifles showed considerable wear, excellent condition examples are not difficult to locate given that the majority of the import of these rifles lasted from the late 1990's through to about 2005. Some dealers still stock a few models, often in like new condition, but be forewarned - Yugoslavian arsenals were VERY fond of liberal application of cosmolene and it can be a real trial to remove it all. Special attention should be paid to leeching the preservative grease out of the woodwork to prevent damage during firing. All models of M48 can sometimes be found completely lacking all markings aside from the serial numbers. These models are collectively referred to as M48BO. BO = "Bez Oznake"
An acquaintance had conducted a study on these rifles and after reviewing over 2,000 assorted Yugo Mausers, observed that no BO's were configured as the model A. Plenty of M48 and more M48B's but not one M48A. Since he gave me that observation, I have been watching and have not seen one either. Many have been reported but upon examination, all were misidentified M48B. If you know of a verified M48A-bo, we'd sure like to know about it. A couple of years ago I got a M48 in still brand new condition in 7.62x51 Nato caliber. Accept for the caliber stamp on the righthand side of the receiver and the serial number on the on the left hand side there is no othermarkings on it. The bolt handel is turned down and the action is fitted with swing off mounts for a telescope. As I had no way of aquiring the propper scope rings I replaced it with another scope mount drilled to fit on the original positions and fitted a 4x42 scope. The accuracy of this rifle is acceptional it shoots 11mm groups at 200 m. I've got the idea that this rifle was produced as a sniper rifle. When I got the rifle the stock wood, (possibly birch) was grey and very dry, but after some almond oil treatment it turned into a light honey colour. Hello, I bought a Yugo m48, and based on what ive read here...my m48 is a all matching BO model. completely scrubbed of markings....the only difference is that the number on the barrel close to the receiver and the number on the bottom side of the bolt are only 2 digits, not three or four. but they both match on my rifle. when i bought it it came with the rifle, cleaning kit, and bayonet with frog and scabbard. It is a beautiful rifle and I the first time i took it out shooting it was glorious.